C0rk.W0rd: That's One Mighty Crock! 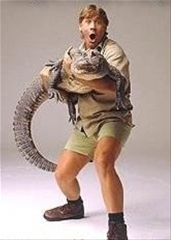 It seems that a rather abrupt change in luck has taken the life of Steve Irwin (known to most as the crocodile hunter). While filming off the Australian coast for a new series ironically titled 'Ocean's Deadliest', Irwin's heart was punctured by a Stingray's bard. The fatal wound has been described as 'extremely unlucky' as the bard had to penetrate the rib cage in order to puncture the heart. "Is this guy out of his mind?" -- I'm sure that phrase has been uttered more than a couple times in reference to Steve's stupefying willingness to interact with and seemingly agitate some of the world's deadliest animals. His death being the result of a freakishly unlucky accident as opposed to a "the guy was attempting to tame a Bengal tiger while dressed in a steak-suit?" IS fortunate.